Napoleon had a big impact on the bridges over the Seine, which he used to commemorate his military victories. The Pont d'Iena is a good example of Napoleon's impact on bridges over the Seine. Its a five span stone masonry arch (built in 1814) with large pedestals at the corners supporting heroic statues of Greek, Roman, Gallic, and Arab warriors and decorated with imperial eagles at the piers. More recent bridges commemorate poets and writers, and the next bridge downstream (the Pont de Bir-Hakeim) commemorates the Free French soldiers who lost their lives during WWII. A nice feature of the Pont d'Iena is that it is directly in front of the Tour de Eiffel, which was built sixty years later. This bridge didn't suffer the fate of the nearby Pont de l'Alma (another of Napoleon's bridges), which was replaced in the 1970's. The Pont d'Iena was widened and strengthened in 1937 and it was put in the historic register in 1975. 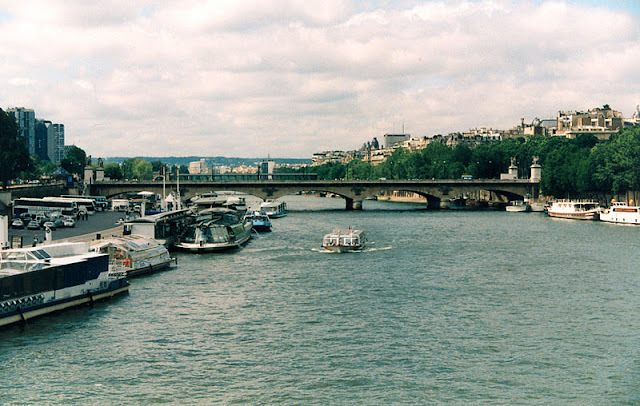 Seine River Bridges: Pont d'Iena by Mark Yashinsky is licensed under a Creative Commons Attribution-NonCommercial-ShareAlike 3.0 United States License.